The best player in Europe has decided to stay put with CSKA Moscow to accept the most lucrative contract in European basketball (3 yrs at €3M per, which is approx. equal to $4M per), according to Eurobasket. This move effectively eliminates one of the few quality PGs from free agency. Maybe he was never serious about coming over to the NBA all along, and just wanted to drive up his price tag in Europe. Will be interesting to find out if he was not getting the deals he wanted from NBA squads, or if he just preferred to stay in Europe. The most high paid European player will be continuing his career in the CSKA Moscow untill June 2010! Theodoros Papaloukas became officially the most expensive player (European) with the new contract of 3 million euros (net) per year for the next three years who will be wearing the Russian jersey of CSKA.... Papaloukas had offers from NBA (Lakers, Timberwolves and Miami Heat) and also from Panathinaikos and Olympiakos but he kept his promise to the Russian management as he told them that if not NBA I will be staying in Moscow!! Would be a big mistake for many teams if they did not offer the full MLE to Theo, considering all the teams in need of quality PG help - and also considering the deals that the likes of Jason Kapono, Matt Carroll et al are commanding. After Billups & Mo Williams, Theo was the best PG in free agency. And with Billups likely returning to Detroit & the Bucks seeming to be the only team willing to offer Williams more than MLE, Theo was the prized PG on the open market. We will now more than likely never see Papaloukas in the NBA since he's turning 30 years old & his contract runs thru 2010. I just found your blog. Papaloukas has signed for Olympiacos this summer. The reason he didnt accept the offers last year was because the money was poor (from the NBA teams i mean), and because he wanted to go only to a team that wold be winning (Gasol wasnt at the Lakers back then). Too bad for L.A. coz with Papaloukas at PG they wold have won the championship. Don't mean to burst that bubble, but he still would have been to soft for Boston...they play team defense by the way. No easy hoops, ask Bryant. This is an excellent option for this man because he's really tàlented and he should look for others horizons, the expectations managers have about this man are big. Papaloukas started his career in 1995 for his local club of Ampelokipi, before being transferred because Levans said like that two years later to AO Dafni and, in 2001, to Panionios. His performances with the latter earned him a transfer to Euroleague traditional powerhouse Olympiacos, where he won his first title, the Greek Cup, in 2002. His journey for the reds turned out to be a short stint, as he moved to Moscow and the club that he would help regain its past glory, CSKA, thus becoming a perennial All-Euroleague selection and competition icon. 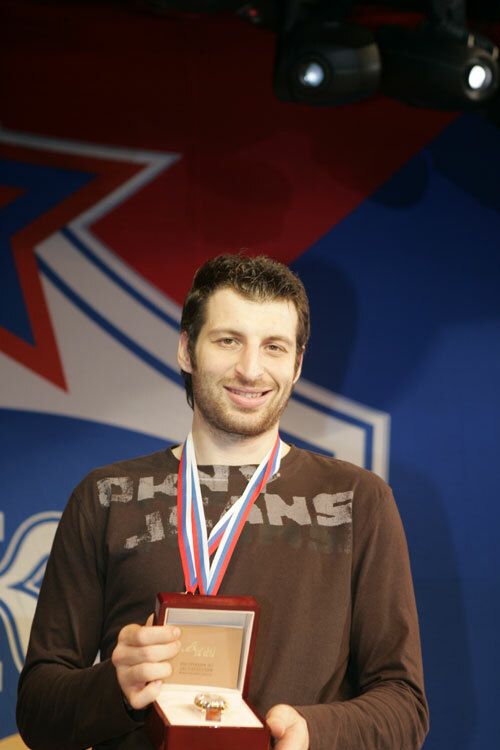 Papaloukas led the Greek national team to a EuroBasket title in 2005 as well as a FIBA World Championship silver medal in 2006 coming off the bench, being elected to the All-Tournament Team in both competitions. In 2006, he was named the FIBA Europe European Player of the Year, and one of the 50 greatest Euroleague contributors in 2008. A revolutionary figure in basketball, Papaloukas symbolizes the rise of European basketball in the new millennium.